The Creative Space Studio moved into Adelphi Mill office space in Macclesfield in early 2011. Since then it’s founder, Debra Tracey, has been busy working on numerous creative projects. What does The Creative Space Studio, Macclesfield do? Debra Tracey, The Creative Space Studio’s passionate founder, explains what they do.. I am holding free mosaic workshops for the general public to work on the Macclesfield Football Club mosaic, at the studio on Mondays but people must book in (01625 560 478 or 07774 920 292) due to limited places. 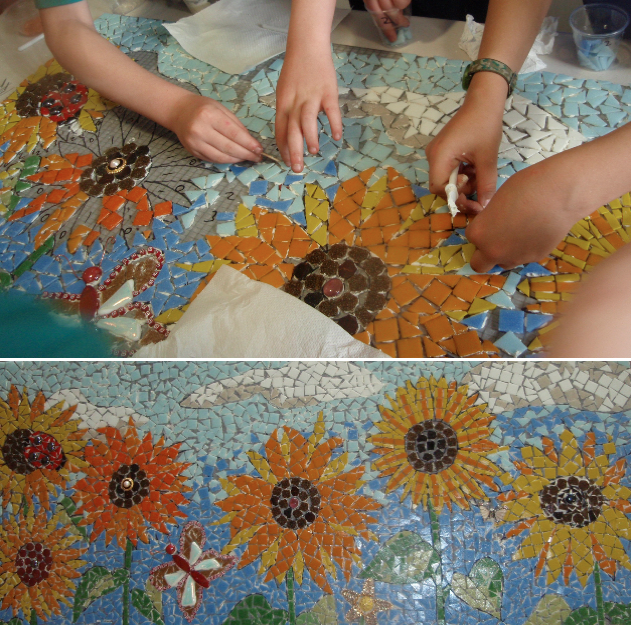 I go out to schools and work with children to produce large-scale mosaic murals plus I deliver one day creative activities such as mask making, silk painting, eco art and much more. I also hold classes and workshops at the studio and have a Figure Studies for beginners course starting in August. Debra goes on to explain about some of the exciting charity and community work going on. Here are some images of the East Cheshire Hospice Mosaic which I am donating which was worked on at the studio, The new Sunflower Centre at the Hospice and also at The Poacher’s Inn, Bollington. Children from St. John’s and Pott Shrigley school will be visiting the studio tomorrow to finish it. I am also donating a 2′ x 4′ community mosaic to the Barnaby Festival and I will be there on the Sunday in the Craft Cafe where children can come and help me make it. They need to bring some broken crockery (it must be safe) and I will either use it on the mosaic if it is safe or swap it for some tiles of my own. Free to participate. 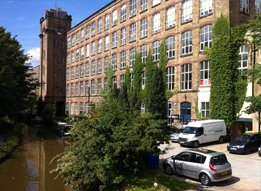 Adelphi Mill provides office space to rent in Bollington, Macclesfield to new and established businesses in Macclesfield. We have two business centres: Adelphi Mill and Clarence Mill which both offer high-quality, affordable office space. This month’s featured office space Macclesfield Tenant is The Infinite Group, an international network of quality business advisors who are now actively looking for individuals to become Partners in the Group. The Group work exclusively with SME business owners in the £1m-£25m bracket advising on growth strategies, M&A, discrete exit planning and franchise development. What makes an ideal Partner – what are we looking for? An individual who has worked as a business manager at a senior level in the corporate world who is considering a career change and wants to work for themselves? We operate as a team to assist business owners of all backgrounds and industries to get the most out of their business. In short we work with business owners who appreciate having some assistance in growing and developing their business. It’s not that they “need help”; it’s more that they are looking for someone to bounce ideas off, hold them accountable and make sure they stay on track. Could they do this themselves? Of course they could. But like all of us, it’s good to have someone in your corner. At times, running your own business can be pretty lonely. Kaizan, a Japanese philosophy underlies VMT’s approach to business and what they have to offer. Kaizan, which means ‘improvement’ or ‘change for the better’ refers to the philosophy or practices which focus upon continuous, incremental improvement of processes in manufacturing, engineering, supporting business processes and management. It emphasises human resources and involves all employees from the CEO to the assembley line workers. By improving standardized activities and processes within companies in Macclesfield and further afield, kaizen aims to eliminate waste. Virtual Whiteboard is an interactive Visual Management Centre which can be deployed across different geographical locations. It provides full real time visibility of performance, supporting a structured, disciplined approach to process management. Virtual Whiteboard provides real time status of the condition of KPIs (Key Performance Indicators) within a few seconds, linking top level performance with detailed activities throughout the business. Any abnormal result or activity is easily identified, allowing the appropriate corrective action to be taken. VMT Macclesfield, create whiteboards according to your individual design & specification, everything from a simple grid layout to a high graphic print. Originally developed for the motorsport industry, where efficiency and error prevention are key, Visual Management Technology’s CICO systems provide immediate visibility that all components and tooling are present. CICO improves time efficiency. Less time is spent sourcing tools or parts on the shop floor and a logical parts layout results in assembly times being reduced. Tests indicate a possible 30-40% time saving. The product range includes kit boxes, tool cases, shadow boarding and tool racking. VMT Macclesfield can also provide bespoke tailoring of inserts for your existing tool drawers and different materials can be used to fulfil the demands of your business. 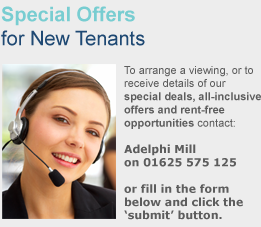 Adelphi Mill offices Macclesfield provide office space to rent in Bollington, Macclesfield. Why not view our available Macclesfield office space to let to see how we could cater for your office space requirements.